Hello friends! It's been a few months seen I had an Influester VoxBox to share with you, but today I've got an especially cool one! 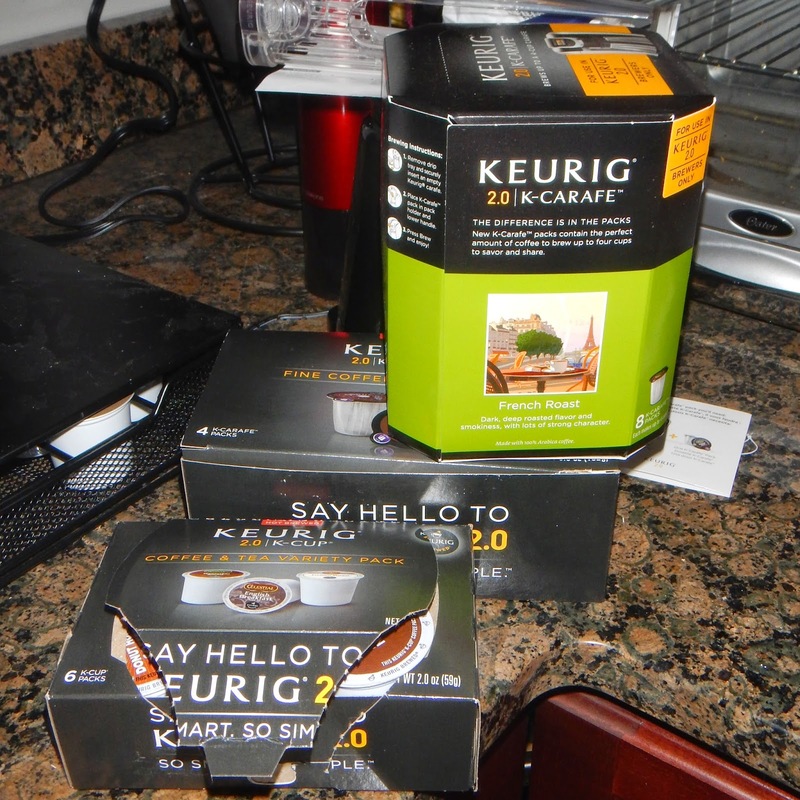 Recently I was sent the brand new Keurig 2.0 to try out and review! 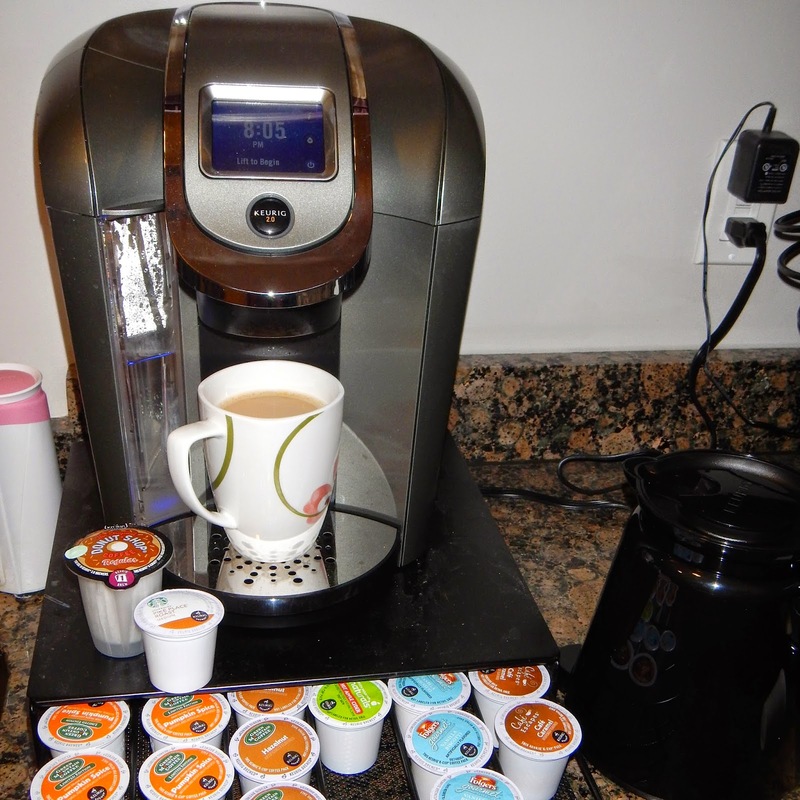 I am sure most of you are already at least aware of what Keurigs are, but basically they are coffee brewers in which you use single-serving K-cups to brew all sorts of different types of coffee easily. You can also brew other sorts of hot drinks (with the right K-cup, of course): hot chocolate, apple cider, tea, and probably more! I already had a Keurig before this actually (and was totally obsessed with it, lol) - so let's see what makes the 2.0 so new and different! The main difference from the original Keurig to the 2.0 is of course that it now can brew K-carafes instead of just K-cups! The machine comes with a carafe (see in the bottom right of pic above) that you just stick under the brewer like a coffee cup, use a K-carafe pod, and it will make a pot of coffee with 3-5 cups! (You select on the super cool touchscreen how much you want to make). Unfortunately, there is another main difference that bothered me quite a bit when I first discovered it. The Keurig 2.0 uses DRM technology in the labels. This is so that the machine can read the label to match the best brewing settings for each individual drink. HOWEVER, it also means that any coffee pod that does not have that DRM tech in the label won't work with the machine at all - it won't brew it (this includes both unofficial, non-Keurig pods, as well as old, pre-2.0 K-cups). Since I already had a Keurig (and with it, a LOT of official K-cups) I ended up with a bunch of pods that became unusable to me in my new machine :\ I ended up giving my old machine to my sister (and with it all the old pods) but it still was kind of annoying when I realized this. K-carafe, new K-cup, old K-cup (must have "Keurig Brewed"
- You can brew plain hot water by just opening and closing the pod-holder without inserting a pod. all the K-cups/carafes included with the machine - it's a lot! - Again, the DRM preventing use of old K-cups. Kind of a bummer. - The water purifier that goes in the water tank was difficult to assemble. I had to get help, lol. - I can't seem to make the hot water function work - it says it makes 6oz, but I usually can only get 2-3oz out (typically has old coffee grounds in it too, no matter how many 'cleaning cycles' I do). Anyway, overall it is a pretty cool machine. Someone new to Keurig would not be bothered about not being able to use old K-cups obviously - and I have gotten over it at this point (helps that I had something to do with them besides just tossing them - I guess I could have just kept both machines on my counter til I used them up, but it's not like I have an abundance of counter space) but I thought it was very important to share this observation here, since it was not something I had initially realized myself. If you are interested in learning more about the Keurig 2.0, check out their website or Facebook for more info! I love the Keurig for single cup preparation. I'm not sure I would want to pay k-cup prices for a pot of coffee.